These three essays provide contextual support for an overarching framework for understanding Mesoamerican cosmology that emerged during the writing of my book Maya Cosmogenesis 2012 in the mid-1990s. My thesis is that three cosmic centers were of interest to the early Mesoamerican skywatchers. Observations of these three centers incorporated precessional movements. Each of the cosmic centers are themselves associated with a deity-avatar. These deity-avatars suggest three anthropomorphized principles, or forces, that every human being containse.g., Eros, Logos, and Dios. Precedent for my tripartite thesis can be found in my work with the Kalevala epic (Ervast's thesis ion his Key to the Kalevala) and the three sacred science principles I decoded at the heart of the tzolkin (see my 1994 book Mayan Sacred Science). The thesis gains further support from my interpretations of the archaeoastronomy and iconogaphy Izapa, in which the three main monument groups refer to the three cosmic centers: Polar, Zenith, and Galactic. The three following essays are brief and serve as way-pointers. The first discusses a tripartite figurine found in the Izapan ballcourt in the 1960s, noted and reconstructed by archaeologist Susanna Ekholm. The implications are supported by my observation of three "levels" embedded into the symbolism of Izapa Stela 22, and a monument showing three enthroned deities from Kaminaljuyu. 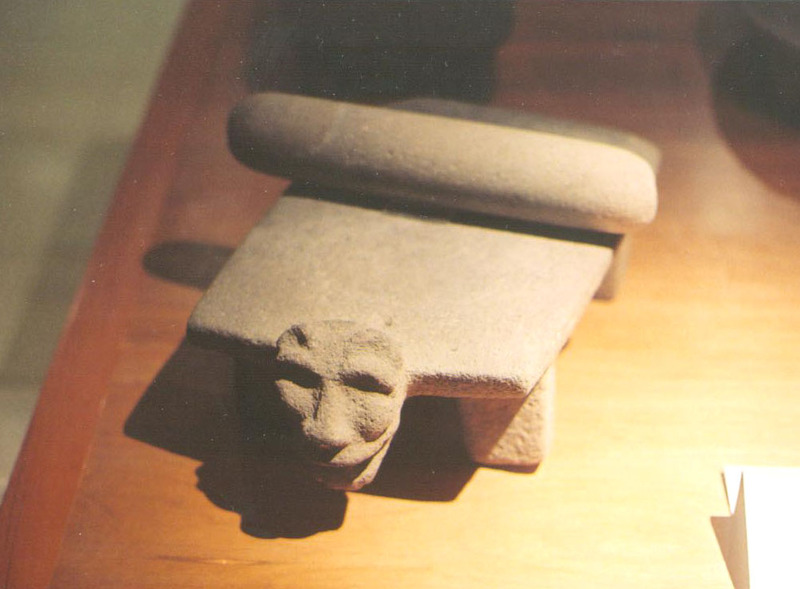 The second essay explores the symbolism of metates and thrones that contain heads on their front side. My interpretation suggests how the Maya understood the grinding process that occurred on metates, the role of the throne sitting king or shaman, and the transformational act of sacrifice in the stela-altar cult. And, interestingly, my interpretation suggests a trinary structure. Finally, I will discuss research amnong the modern highland Maya that identifies three moeties or clans, each of which utilizes latter-day versions of the three cosmic-center deities as their symbolic progenitor or "head". This modern survival suggests a continuity of structure in Mesoamerican culture and religion that goes back at least 2,000 years and that utlizes a three-part framework. A fascinating essay just recently came to my attention while I was exploring various articles relating to Izapa on the JSTOR archive of academic journals. 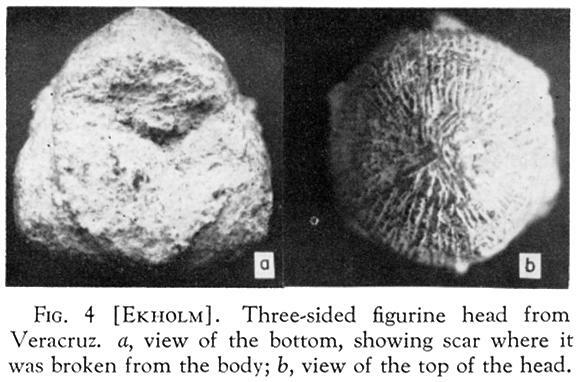 Mesoamerican archaeologist Susanna Ekholm, who worked with Brigham Young University on various projects connected with Izapa and other sites in southern Mexico, wrote a short piece in American Antiquity in 1968, in which she identified and reconstructed a three-sided figurine. It had been recovered from Mound 30s, which is the one just west of the Throne and ballcourt. It is the high mound that gives a good view of the ballcourt looking east. The throne-sitting figure that I illustrated in my book Maya Cosmogenesis 2012 was recovered from the same mound. Ekholm notes it came from a pre-Classic stratigraphic layer, and thus it dates to the era in which most of the carved monuments were done. Her essay is: "A Three-Sided Figurine from Izapa, Chiapas, Mexico" in American Antiquity, Vol. 33, No. 3 (Jul., 1968), pp. 376-379. In India, there are many examples of trimorphic deities. A trinity of deities  each being a facet of a higher unity  is commonplace in many religions, including Christianity (Father, Son, and Holy Ghost). It should also be noted that the figure's vertical body implies a fourth element and thus an equilateral Platonic Solid pyramid form. However, the central axis represents the unity that embraces the three aspects, and is not a separate element in its own right. Similarly, the fifth element in the widespread quincunx symbol is in the center, and unites the four corner aspects. My hunch, which may or may not eventually be shown correct, is that the tripartite deity represents the cosmological paradigm of three cosmic centers, which is especially present at Izapa. It may even have been pioneered at Izapa. Zenith, Polar, and Galactic are the centers, and the associated deities are Quetzalcoatl, Seven Macaw, and One Hunahpu. I also suspect that this framework survived into the post-Classic as cofradia lineages, aspects of which can be identified in the Popol Vuh and the dance dramas and socio-political systems among the Maya of Rabinal (see Ruud van Akkeren, The Place of the Lord's Daughter). I'll also mention my thesis of three sacred science principles (related to the Tzutujil paradigm of time and change called Jaloj Kexoj) that I explored in my 1994 book Mayan Sacred Science. These three principles are mathematical expressions of what can be anthropomorphized as human qualities, as evidenced in the three heroes of the Finnish Kalevala (see Ervast's Key to the Kalevala, which I edited and wrote the intro for). A rich tapestry of possibilities await to be explored in these connections. 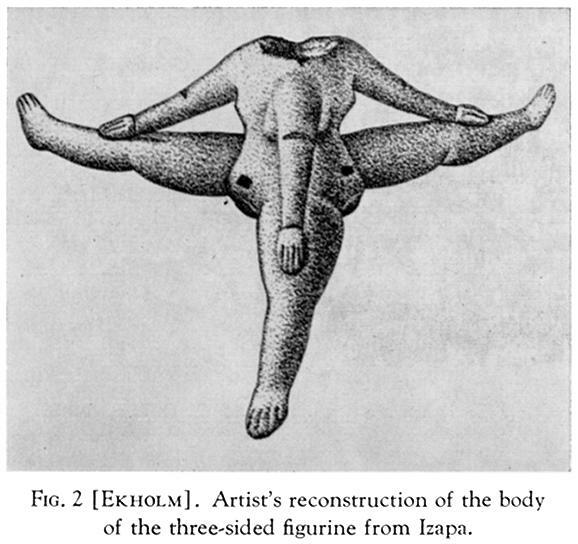 "A Three-Sided Figurine from Izapa, Chiapas, Mexico," in American Antiquity, Vol. 33, No. 3 (Jul., 1968), pp. 376-379. The throne is pictured with the other stone monuments that were found next to it, whose symbolism reiterates that of the head being born from between the legs on the throne. The BYU archaeologists who excavated Izapa in the 1960s commented on this throne, and suggested it was the diving god. This means what I see as legs would insteads be arms. Their interpretation seems unlikely, since clearly a birthing is being depicted, which in turn reflects the December solstice sunrise alignment of this throne and the entire lengthwise axis of the ballcourt. Remember, this throne is on the west end of the ballcourt and faces down the lengthwise axis, toward the dawning December solstice sunrise. The December solstice represents the rebirth of the year; the head on the throne is a solar god-head. In addition, throne-sitting kings or shamans performed a kind of birthing, since their function was to connect into the higher center and source and "birth" new life into the kingdom. 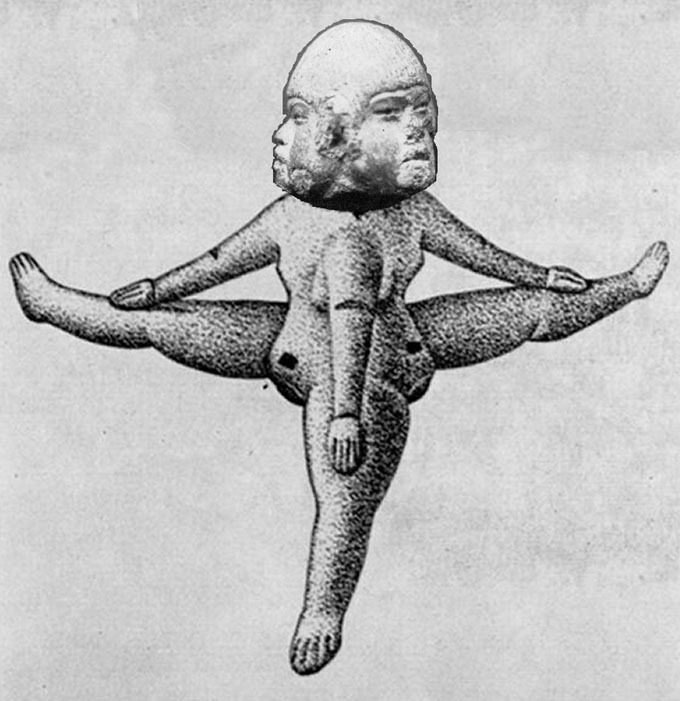 Also, the throne-sitting figurine that was found in the mound behind the throne is in the so-called "hocker" position - legs splayed and birthing. 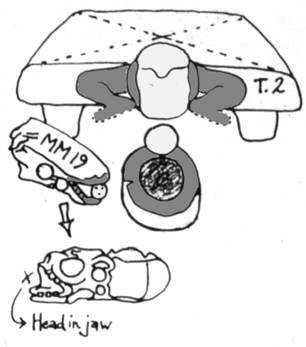 All of this goes to argue that the head is emerging between legs, not arms. The flat (sometimes concave) top surface of the metate receives the phallic pounding stone, which is shaped like a pillar. Here we have the above and the below, the female receptacle and the male agitator. The grinding action is a sexual metaphor, and a transformation happens at the friction (or conception) point where they meet. The intended result of this sexual grinding is the transformation of corn seed into a fine homogenous powder. The hard, individually shaped nuggests of corn seed are ground and transformed into the soft, homogenous fine powder of corn flour, or dust. Form has been changed into the formless. This end product is the third component in the tripartite cosmology of the metate grinding stone, and the head and mouth on the edge of the metate (or throne) indicates where the fine flour will be spewed. This situation is reminiscent of Quechua women who chew material that, activated by their saliva, can turn into chicha beer after it is spit out. In this sense, the head on the front edge is a rotated horizontal projection of the center of the throne on top, the center of the cross formed by the throne's four corners and therefore the location of a center and conduit hole connecting different realms. Vessels and gourds are often illustrated in ways that suggest shifting imagery between holes, mouths, backs, and pouring spouts. The headed thrones morph into drinking vessels. These ideas could be developed further, elucidating more deeply how the throne and metate symbolism are interrelated and relate to birth metaphors. This metaphor is really only to be considered as a literary device, for the latest chapter of my Remembering 2012 novel is a chapter about Tak'alik Ab'aj called "Standing Stones." I've outlined it, and it utilizes the tripartite idea in a new way. Fact: The grave of a king is placed roughly east-west, perpendicular to the north-south alignment of the standing stones that serve as precession-tracking markers to Draco. Fact: Tak'alik Ab'aj is believed to integrate Izapan and Mayan cultural traditions, and Stela 5 at Tak'alik documents a meeting of Izapan delegates and preserves two long count dates relating to the Izapan era and the Mayan era. An earlier Olmec context of the site is indicated by Olmec monuments, and is conceptual implied via La Venta's similar precession tracking method. Izapa, however, preserves a method via the myth of Seven Macaw's Fall, rather than archaeoastronomical stone alignments. Here's the three-part metaphor: Three angles to the north fall over the body of the dead king; they indicate the three eras, Olmec, Izapan, and Mayan. They fall over the three parts of the king's body: solar plexus (ego), heart (integrative synthesis), and throat (voice). These in turn reinforce the three eras and cultures. This is only presented as a creative exegesis, useful as a literary device.